FCAP offers a complete Family of Services including a monthly trade magazine, online CEU training and manager certification, peer-to-peer networking, industry awards and recognition programs, and career placement services. 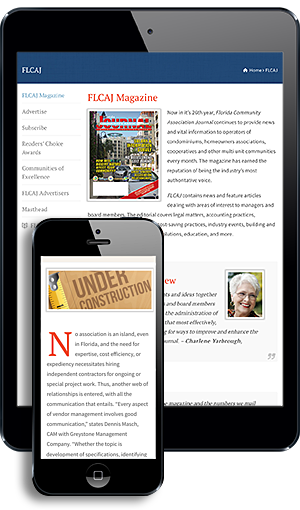 Published since 1987, Florida Community Association Journal, continues to provide news and vital information to operators of condominiums, homeowners associations, cooperatives, and other multi-unit communities every month. The magazine has earned the reputation of being the industry’s most authoritative voice. FLCAJ contains news and feature articles dealing with areas of interest to managers and board members. The editorial covers legal matters, accounting practices, insurance, rules enforcement, cost-saving practices, industry events, building and grounds maintenance, security solutions, education, and more. FCAP Schools is our online training center and home to the Florida Advanced CAM Studies (FACS) course and FCAP’s “CEUs from Home” program. The FACS course is the prerequisite for the Certified Florida Community Association Manager designation. FCAP Schools is located at www.fcapschools.com. CondoJobs is Florida’s oldest and most trusted manager recruiting service and is committed to meeting the changing needs of both managers and the communities they serve. Condojobs is a confidential partner committed to matching licensed community association managers with communities and management companies that are in need of their services. Condojobs always has available managers and open jobs to offer. The FCAP Awards were created to recognize communities, individuals and service providers that demonstrate exceptional service to the community association industry and the larger community.